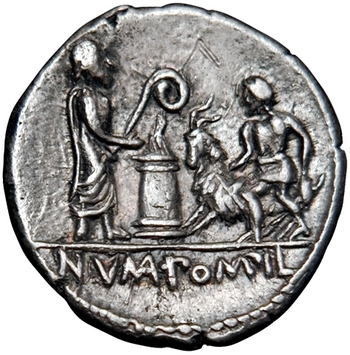 Servius Tullius on a Coin? I’m thinking about potential connections between RRC 372/1 and RRC 334/1. This is building off of an old post of mine. These are the only two scenes of sacrifice on the republican series, other than those which show the creating of a foedus (oath scenes with a pig). Anyway. I just wanted throw up this 1924 commentary on Plutarch’s Roman Questions. The question is: was the de Viris Illustribus actually preserving an alternative ancient tradition or was it just an error? Antro in Cicero appears to be a freedman and Antro his slave name which are often chosen for ethnic connotations (cf. Cic. Fam. 15.20.1). 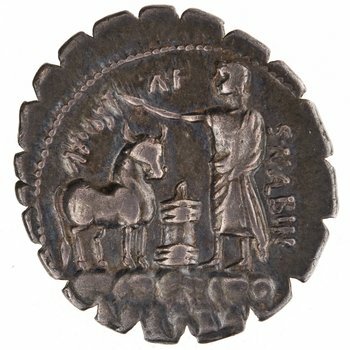 Curiatius is a name most associated with Alba in Latin literature (general survey, but note esp. Livy 1.30).